The meticulously restored 1916 Courthouse building is perfect to fall a little more in love with West Palm Beach. New exhibits on display will help you learn about our past where you can dive into compelling stories and traditional riches of shipwrecks in our area. 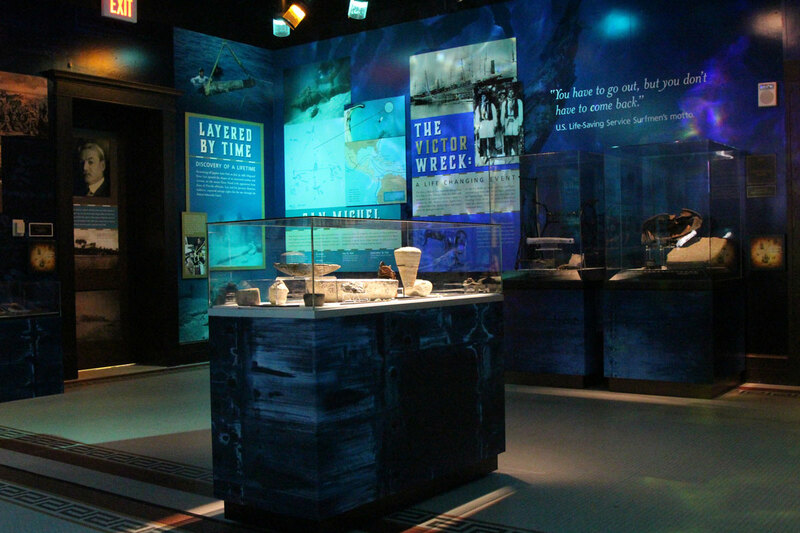 View of the Shipwreck: Discovering Lost Treasures exhibit at the Richard and Pat Johnson Palm Beach County History Museum / Photo: Danny Rodriguez, WPB Magazine. What do you do in the Sunshine State when there’s not one ray of sun? Rainy days don’t have to be a bummer or a bore. Even in West Palm Beach (where part of the draw is, well, the beach), we’ve got options. 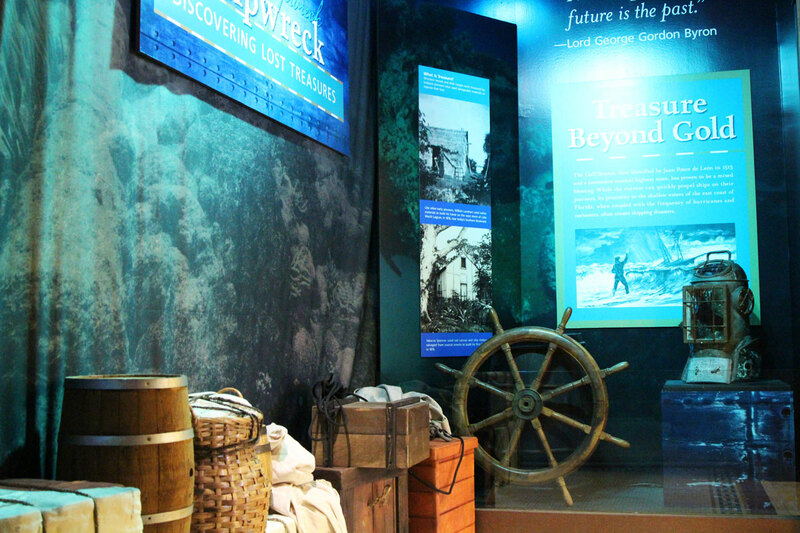 I recently paid a visit to the Richard and Pat Johnson Palm Beach County History Museum for the first time to check out the Shipwreck: Discovering Lost Treasures exhibit. 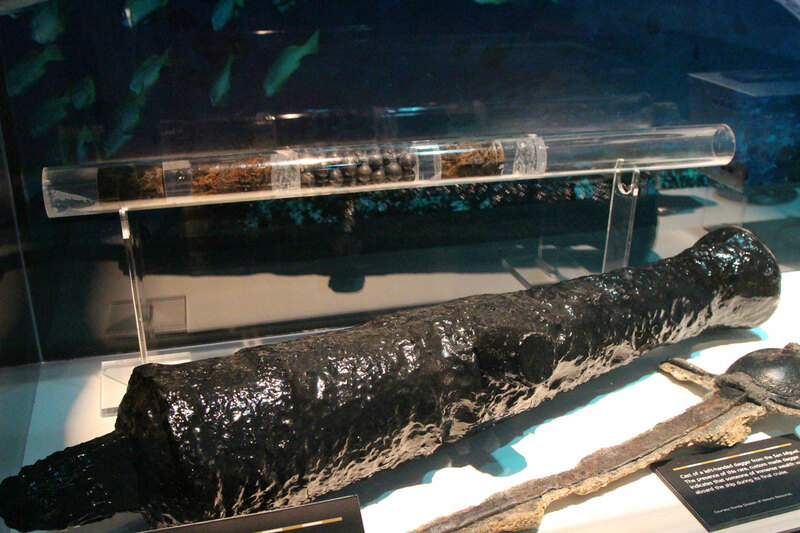 The exhibit contains treasures from local shipwrecks and a brief look at the maritime history of our area. 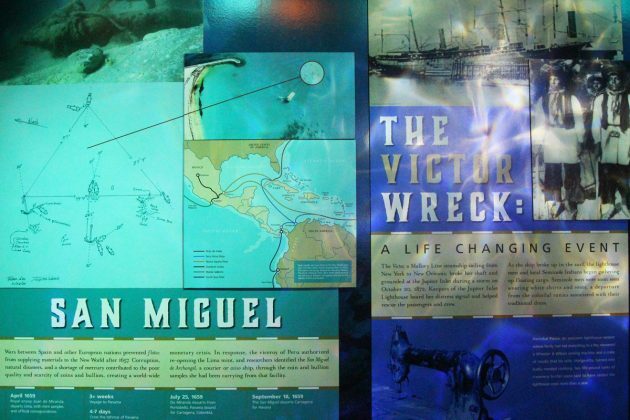 This exhibit uses the lens of several wrecks between 1660 and 1984 to explore the impact of nautical disasters on local people and places. 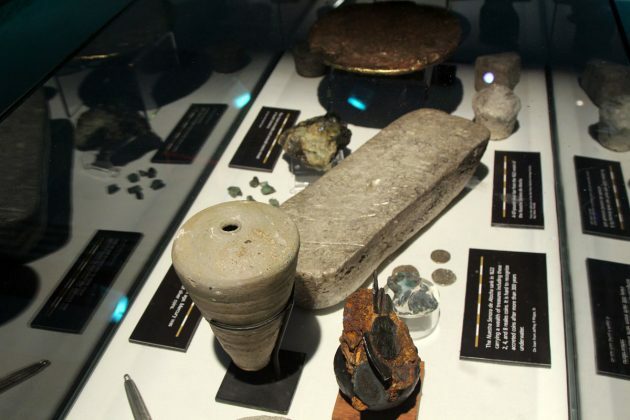 Broken vessels held gold and jewels, along with other treasures — items prized by early pioneers. Decayed hulls have since evolved into recreational destinations for divers, and several abandoned ships have been re-purposed as artificial reefs that also support the marine ecosystem. 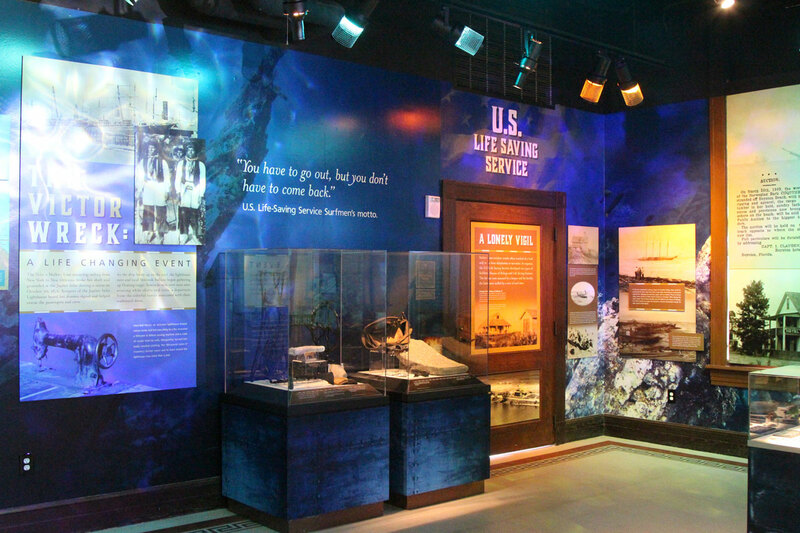 In a few words, compelling stories, harrowing tales and the traditional riches of shipwrecks will redefine your understanding of “treasure” when you visit. The exhibit will remain until June 30. What most captivated my attention, though, were the permanent galleries at the museum: The People Gallery and The Place Gallery. The People Gallery contains tributes to notable Palm Beach County residents and visitors whose contributions made lasting change, complete with oddities and artifacts like a wicker pedaled carriage. The Place Gallery explores our area’s natural environment and even has a life-size model of the legendary Barefoot Mailman. Upstairs, you’ll find a rotating set of courtroom exhibitions. The Historic Courtroom Gallery is interesting on its own–it housed the legal goings-on of the area for decades–but the best part is the frames lining the walls. Their contents change every few weeks, but all draw on our area’s colorful history. Recent themes of the courtroom included Centennial Faces–photographs picturing the lives of middle class African-American citizens in Tallahassee one hundred years ago–and Picturing Nam, which displayed images of the Vietnam War taken by military photographers. Up next is Beaches, Creatures and Cowboys: Florida Movie Posters, here until July 28, which presents historical posters of films shot in Florida. 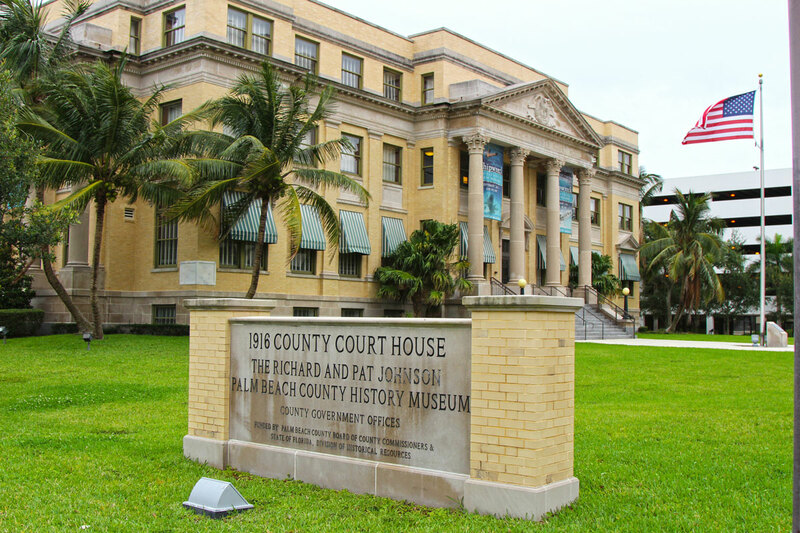 View of the Richard and Pat Johnson Palm Beach County History Museum / Photo: Danny Rodriguez, WPB Magazine. Visiting the Johnson History Museum is always a perfect activity because you’ll linger and read about each of the items on display. I guarantee you’ll leave with a renewed appreciation for the events and people who made West Palm Beach into the paradise it is today. The museum’s the right place to fall a little more in love with West Palm Beach. If you visit, admission is free—Donations accepted— and it is open Monday – Friday, 10 a.m.–5 p.m., Saturday, 10 a.m.–4 p.m. Closed Sundays and major holidays. Get in touch with Skye at @skyesherman on Instagram, Twitter, and Facebook.